I don’t know about you guys but when it comes to beauty products and things that I use on my skin, I am always a little skeptical about trying new things or brands that I haven’t heard of. 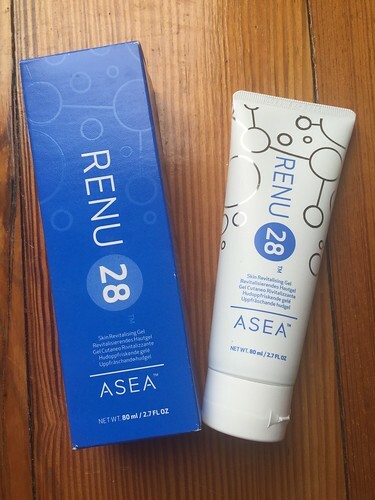 When I was approached to review the Renu 28 Skin revitalising gel, I had no idea what to expect. I had never heard of Renu 28 nor the values that the brand held but I was more than intrigued when I heard that it contained only four ingredients and used salt water as a basic concept for skin renewal. I hate putting things loaded with chemicals anywhere near my face so I was relieved when I read that it was all natural. In order to give the product a true review, I used it for just over 4 weeks. At first, I didn’t like the feel of the product at all… it felt a little like water to me. Not thick and creamy like a moisturiser but more like a watery gel. I was almost about to give up in the first week or so as I didn’t notice any major results on my skin, but with perseverance I continued beyond the two week mark and I finally started to see some real results. My skin had a glow that I had never seen before. I suffer from breakouts quite regularly on my skin so it was amazing to see it with a little glow and a healthy look. I know that bloggers always review products and say they are amazing – so I am not going to feed you with any lies and say that this product will transform your face – it won’t. But it will make your skin feel softer, look healthier and will even make your make up sit a little better on your face. I used it in the lead up to my holiday in Tenerife and I felt it was the perfect prep for my skin before exposing it to the sun! I received my Renu 28 thanks to the lovely Kathryn McBrearty who can be contacted via Facebook on her page Rejuvious which you can see HERE, or if you have any other questions about my experience you can contact me on Facebook as I would be happy to help.